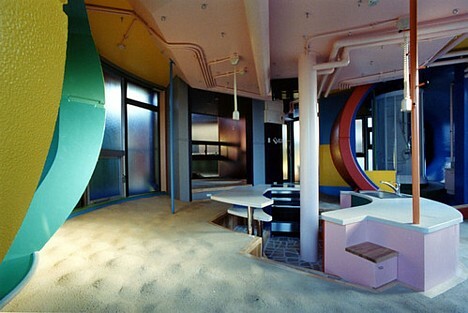 To NY-based architect-poets and "reversible destiny" philosophers Arakawa & Gins, comfort deserves only a limited role in the home. In their vision, a home that keeps its inhabitants young and healthy should provide perpetual challenges. A tentative relationship with your environment, they argue, is key to "reversing the downhill course of human life." 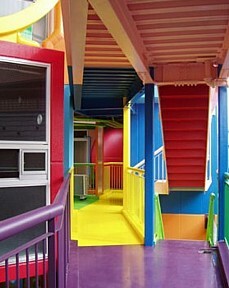 This video takes a peek inside their Reversible Destiny Lofts in the Mitaka area of western Tokyo. 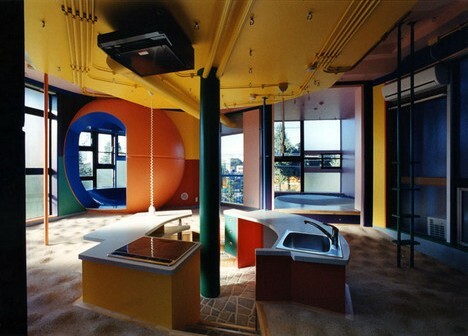 Designed to stimulate the senses and force inhabitants to use balance, physical strength and imagination, the lofts feature uneven floors, oddly positioned power switches and outlets, walls and surfaces painted a dizzying array of colors, a tiny exit to the balcony, a transparent shower room, irregularly shaped curtainless windows, and more. For the adventurous, two rental units are now available for 220,000 and 250,000 yen ($2,000/$2,400) per month, which is a bit pricey for Tokyo, but not outrageous. Short-term stays can also be arranged. Very interesting. Yet over time people can adapt to just about anything. Unless the apartment also changes randomly over time, I don't think it would make much of a difference in the long run. 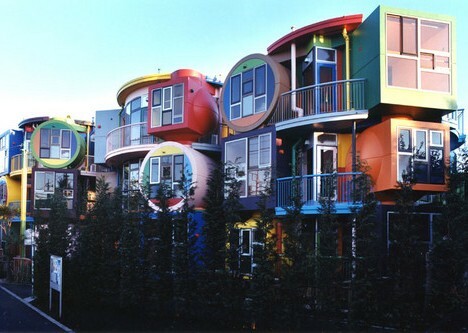 i love the colorful exterior and random windows in this building � just don't come home drunk! I know exactly where this is. I accidentally found it while wandering around. These buildings really stuck out among the rather bland suburbs that surround it. Maybe next time I move, I'll keep this in mind. 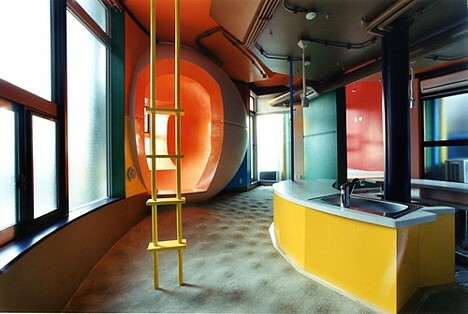 Isn't this were Jonathan Ross's apartment is? "A bit pricy for Tokyo" here means "insanely pricy for the Mitaka neighborhood where these things are"--on a very busy road and near no train stations. It's about a 10-15 minute bus trip from here to Musashi Sakai or Mitaka. They are quite close to ICU's campus, though, if you're a student with a huge pile of money to spend on rent. HA! i can get you the same "perpetually challenging" experience for a heck of a lot less than "market value" - move into a low-income neighborhood, into a crappy, poorly-maintained building. that way, you get a lot more variability in your challenge! today, you get mugged on the way out of your building. tonight, your water pressure changes every 15 seconds, tomorrow, you might not have water at all! want to challenge your imagination? you can routinely expect break-ins that will rearrange your belongings, and you will learn what it means to not rely on electricity. AMAZING! Now this is the right fit for me. I want something calm, I go to my garden. But how much fun is this. Naturally only for a couple of years and tons of parties. Then I am off to the country. OK, so it is supposed to keep you young with physical challenges, uneven flooring and all of that. Speaking as one who these posturing dimwits wanted to address (as opposed to twentysomethings) this is just a flat-out stupid idea. Uneven flooring for anyone over 40 or so is a bad idea (think broken limbs if in a hurry). Bad lighting, crazy-quilt colors, "physical challenges' to perform everyday functions ... not a great idea for anyone with any kin of aging-related handicap 9(think osteoarthritis, or a bit of macular degeneration, for example). in short, this is utter rubbish pawned off on the world as a new idea but really just an exercise in idiocy provided by designers who have no idea what a functional aesthetic is. Wasn't this what those so-called "Live/Work Lofts" in San Francisco were supposed to be like? I wish I was rich enough to be that bored. Someone said we grow brain cells, this statement needs to be corrected. We don't grow brain cells, our brain prunes out unused neurons as we grow older. We only prune the neurons we don't use though. So the more areas of our brain we use the less we lose as we grow older. As a 65 year old this fascinates and intrigues me. 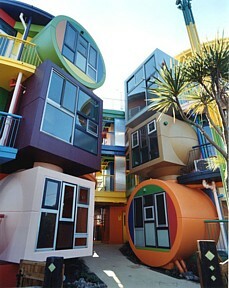 I would LOVE to try living in one of these apartments for at least 6 months. I feel that initially I'd be very tired and exhausted from the effort required, but instinctively I feel in the long run it would help strengthen me.